Welcome to Hogwarts. 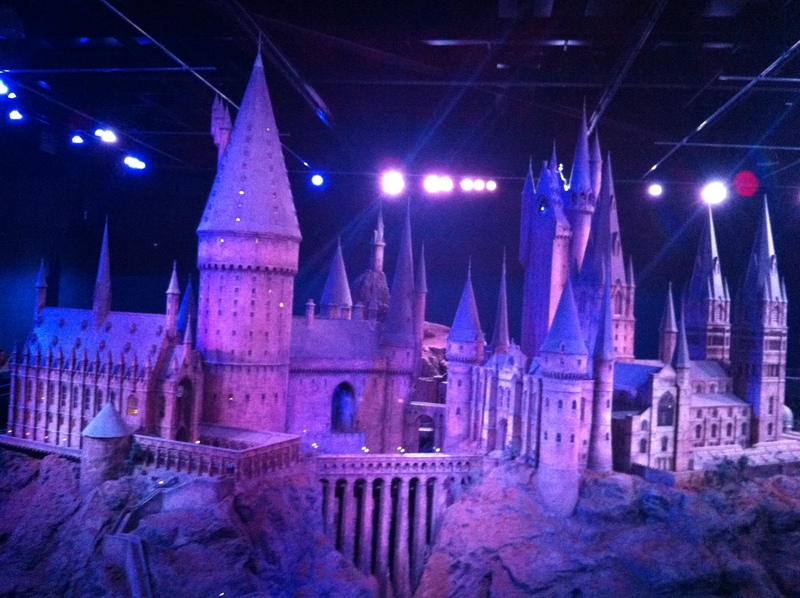 WB’s Harry Potter Studio Tour, Leavesdon, England. September 2015. WARNING: MAJOR FANGIRL ALERT AHEAD! YOU HAVE BEEN WARNED. A few weeks back, I was once again so lucky to hit the Warner Brothers’ Harry Potter Studio Tour, which is amazing. I talked about this once before back in June 2014 (after my first visit), but it was a brief mention hidden in my nerd/fandom post about traveling around the fandom-centric sites of the UK. This post is going to get more specific, but I won’t tell too much and give anything too big away—you’ll have to visit and experience it for yourself! I’ve grown up with these books, these characters, and this world. We listened to them on cross-country road trips narrated by Jim Dale, I’ve gone to book and film midnight releases dressed in Potter-bound apparel (I’m not a full out costume person), slept curled around the seventh book during my mid read nap so no one in the house could steal it, been to the Los Angeles’ WB Harry Potter/Costume/Lot museum, the London tour twice now, the theme park in Florida and can’t wait for the opening in LA. There are probably more—including the Ravenclaw cardigan I am currently sporting and its Slytherine double hanging back at my flat which have begun to grace my work and everyday wardrobe—but this list feels sufficiently long enough. I’m technically a Ravenclaw (through and through—thank you, Pottermore), but I have a not so secret desire to fall a bit more on the green side, and that streak is strong. There is a whole theory I have behind this (which doesn’t even touch on my high school feminism and Harry Potter thesis), but alas, I digress (feel free to ask me about it, however!). Anyway, as one of the cast members explained to a nearby group, where Florida is a theme park, The lot tour in London is a giant museum—and I emphasis giant. Filling two large sound stages and some of the outdoor space between them, this is really The Harry Potter museum. Each of these sound stages is filled with the real costumes, props, hair pieces, and sets used to film the film adaptations. While you can’t walk onto (most of the sets) you can take as many pictures as you want of everything you see and a few bigger sets even have small interactive aspects. You are led through the tour by videos playing across screens throughout the tour as well as large information signs, but you can buy (either with your ticket or before entering the tour) a personal media tour guide which will give you more digital commentary on what you are seeing, behind the scenes stories, and image galleries you wouldn’t see otherwise. My suggestion: if you are a big fan, you’ll want to get the earliest entry time available. We went in at 10 am and left the lot at around 5-5:30 pm; they announced the last tour entry when we still had a few rooms left to go—rooms where we spent the most amount of time as well! This being said, we listened and read absolutely everything, stopped for a quick bite at the midway point, and spent more time than I’d ever considered in the wand room (which I’ll get to in just a minute). The second half of the tour is great for anyone interested in the design aspects of film making from prosthetic work to models while CGI falls near the end of the first soundstage. This second half also showcases artists’ renderings and concept art which are so beautiful you’ll want them for your house—again, you can take pictures of all of this! Before we get to the wand room, as promised, I want to touch on the food situation. This was updated from the first time I’d gone on the tour three years ago, so it’s a fully enclosed area. There are two areas you order from: one is everything (food and drinks) and the other is the Butterbeer stand. The set up gets crowded so if you have a few people, after ordering, leave one or two to grab the food (party size depending), a few to pick up the drinks, and anyone else to grab a table. But onto the Wand room. My other post touched on the beauty and awe of the large scale castle model—again, I almost burst into tears and probably spent a good hour in this particular room on each of my visits—but I never even considered until this last trip, how long a person could find themselves wandering the wand room—the last room you enter before hitting the gift shop. This room looks—at a simple glance—like a neater version on Ollivander’s Wand Shop. These wand boxes, however, are not real props and do not contain wands—instead, each box end has a name of a person who worked on the film in some way over the course of the 8 films. this rangers from actors and directors, to prop designers and camera crews; if a person was listed on the workers books, they have a box. Most visitors fly through this room without a second thought, however, inside this room, there is always a robe employee who you can ask to point out anyone whose box you’d like to see. We spent probably the same amount of time in this room as we did with the castle model, asking the employee about everyone we could possibly think of and she pointed out a few extras we hadn’t even thought to ask about (don’t forget, J.K. Rowling has her own box as well!). If you are lucky and really give the employee some tough things to remember, they may even give you some extra stories they’ve learned for the sets and about people named in the room. This room was truly so much fun! Once you are out of the wand room, you enter the most dangerous room in the whole tour: the gift shop. A neat tip we got from the girl in the wand room: You can try on and take pictures with anything without buying it—robes, sorting hat, ect—though I’d note, within reason! This is great if you can’t afford to buy these items but want to instagrm a picture souvenir. My go to purchases are the house sweaters and cardigans, and this is the place I’d go to buy them because, unlike the shop you will find in King’s Cross station (another thing I missed from fandom locations I’ve visited), these sweaters do not have house logos! There are pros and cons to this fact, however, both dealing with the fact that they look like normal clothing. This means you can get away with going Potter-bound anywhere and no one is the wiser. It also means that your cosplay is closer to the films where they aren’t patched. Unfortunately, this means that the sweaters look like your everyday, inexpensive sweater, but with a fandom price tag which (at least) doubles the cost. With that in mind, it’s a tossup. Since I’m not growing anymore, I’m fine with what I have now, but I’d be wary about buying for kids. Also, make sure you get the washing instructions from the checkout; the sweaters shrink up a lot in the wash so the directions are very important since you are paying so much you don’t want to ruin them! For all the other logistics from prices to how to get to the lot (plan well ahead for this; if you are late and miss your window, they say you may not be allowed in), check out the site. And a final note from me: be aware of the season and times you are going. Tourist season has heavy traffic through the tour as do various times through the school year (like in September!) when school trips come through! And with that, I think this post has gone on long enough. If you have anything to add, questions to ask, whatever, comment below! 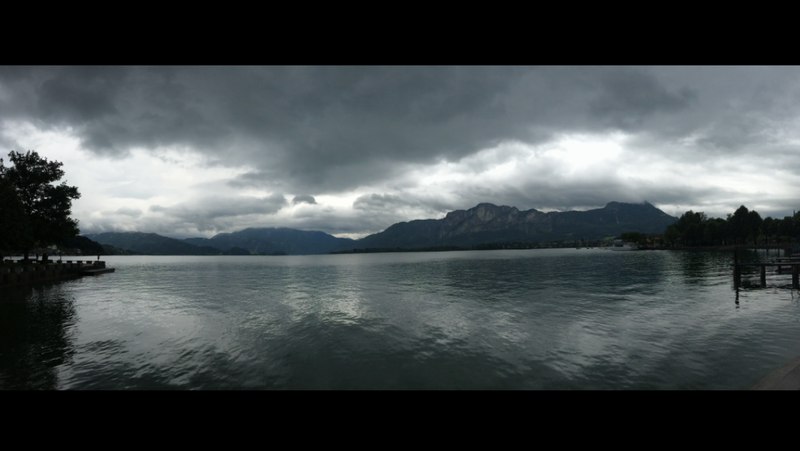 Beautiful lake outlook outside of Mondsee. Mondsee, Austria. June 2015. In fact, one of the things that Salzburg is famous for is being the home of composer Wolfgang Amadeus Mozart and, as you wander the city, you are bound to run into his image as well as places he grew up. As one of the major draws, these locals get busy during travel season and they do charge admission. Mozart, however, did not compose the melodies that dragged the Gallagher Girls to this great and historical city. No, it was Rodgers and Hammerstein and the “Sound of Music,” the heroic tale of love, music, and trials based on the lives and goings on of the Family Trapp who resided here. 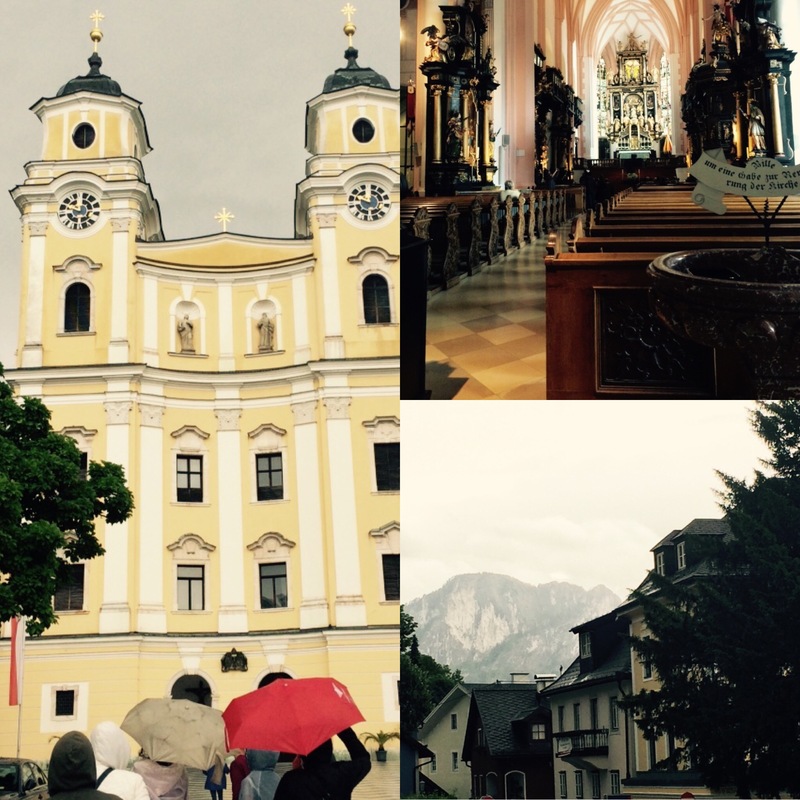 Salzburg is a beautiful city and, the truth of the matter is, you can’t wander through the city proper without running into an area that was glimpsed in the film, especially in the overview of the city and jump scenes during “Do-Re-Mi.” But we’ll hit more of that later. 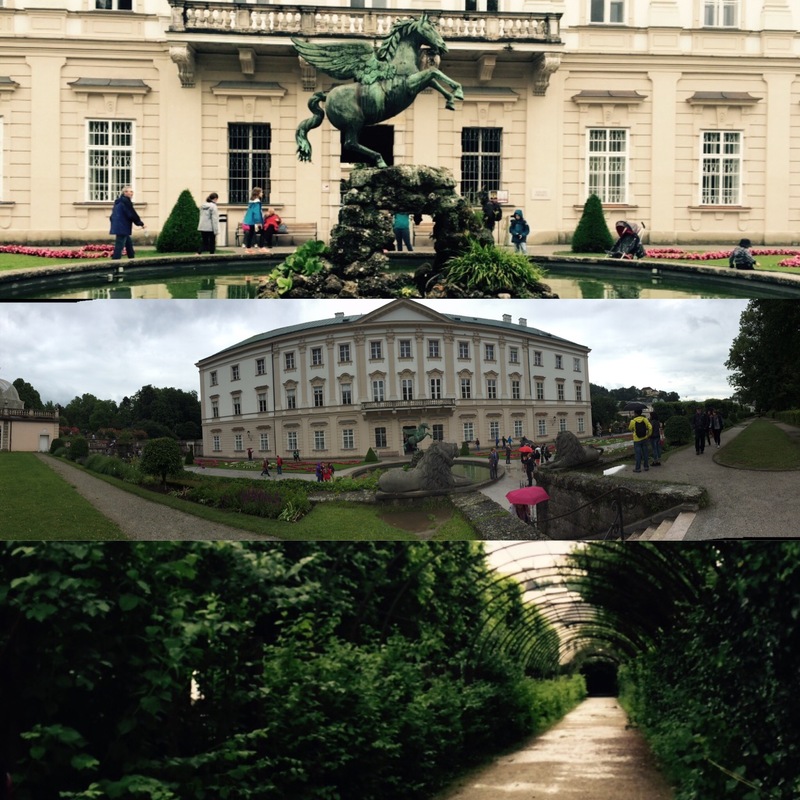 While Salzburg proper houses many locations to peruse, to hit many of the main hubs, you really have to get out of the city—like hours outside. But fear not! Tours from many companies will take you to these scattered locations so there are plenty of options for you to shop around with. We used the same company as we had the day before (Viator’s Super Saver) and, just like that tour, I could really recommend this one. Slazburg Filming in Mirabell Gardens. 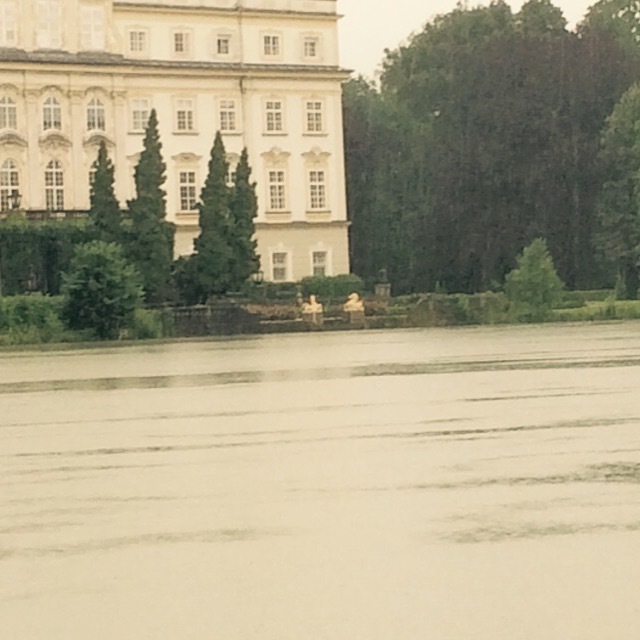 Mirabell Gardens, Salzburg, Austria. June 2015. Where we didn’t hit as many sights as I had thought we would—this is a half day tour—we hit the big stops that we could, were highly entertained between stops (beware there are long periods spent on the coach! ), and very educated on both the film, issues of adaptation, and the true history behind the Trapp’s story. WARNING (this is one of the things we were told on the tour as well): there are a lot of people who are hung up on the idea that the events of this musical are facts, or at least, close enough to fact to accept them as life affirming truths. If you think I’m exaggerating, the tour guide explained that he has been told on multiple accounts that he had “ruined” people’s lives by talking about these changes, so again, be warned. If you realized that the story changed (after all, this is Hollywood and based on an extravagant musical—neither of these forms take accuracy over flash and story potential, nor should they necessarily!). But alas, to the tour. There are three major stops on this tour as well as an optional quick stop after the drop off if you are so inclined, and going back by yourself is an option I wish we’d had time to consider. Our first stop—in the rain, obviously, was the backyard of the von Trap house where many scenes were shot, but, most famously, the capsized boat scene and, just down the road, the children playing in trees. This stop is actually not at the house—buses and the like aren’t allowed in, however, you can apparently walk or bike in and take a look around—but across the water from it. This gives you a great look at this famous spot and is great for photos if only show how beautiful it is, if not for cinematic reasons. Trapp’s back garden. Salzburg, Austria. June 2015. But now onto some Hollywood trickery: this house is the backyard and river front of the house, however, that’s all it is. A different house is used for the actual house front and back (you can imagine how many scenes had to be done over and over in multiple locations!) because they couldn’t get permissions in time to use any of the actual house. But you’d never know watching the film, would you? Oh, the magic of Hollywood! After this stop, you clamber back on the bus to head out to Schloss Hellbrunn which was built as the summer day palace of Markus Sittikus von Hohenems, Prince-Archbishop of Salzburg. We had visited this site earlier in the trip and, Sound of Music fan or not, it’s a spot you can’t miss and will have to stop back at. All in all, take a tour of the gardens when you go back without the tour, but stay alert and be prepared to get a little bit wet! But the reason we mention this stop on the “Sound of Music” Tour is this is the current location of the official gazebo replica featured in both “Sixteen Going on Seventeen” and “Something Good.” The fact is, you can’t see the original—it’s gone—so this is a great substitute. Unfortunately, after an incident with a woman in her 80s trying to recreate “sixteen”’s more challenging dance steps which ended in injury, you can no longer go inside the gazebo, but seeing the size of it is worth it for a fan of the film. One other extra, if you take the bus to the end of the line away from Salzburg from this point, you’ll be able to take a cable car up to Untersbergbahn which is the mountain that Maria claims to have grown up on and, therefore, where she could never get lost. The views are great (when it’s clear!) from the top and, if it’s a little gloomy, the views from the cable car will help rectify that loss. This isn’t the mountain where the scene is filmed—you can apparently take private tours to that location and run around singing, however—but another bit of Hollywood magic happens here which isn’t hard to track: Maria really couldn’t have heard the bells and run from the mountain tops to the abbey in Salzburg in the course of the song—in my judgement, that would have been almost a day’s trek, but, for cinematic and tonal reasons, this all make sense. Monsee filming locations. Monsee, Austria. June 2015. The last major stop is to Saint Michael’s church where Julie Andrews and Christopher Plummer “married” in the film. This, however, is not the real location of the Abbey or where Maria and the Captain were wed. Once again, the Hollywood crew was not given permission for those locations, so the movie simply made do. The strange thing about this location was the sense of size. To me, the church and the central aisle felt so much smaller than it appeared in the movie which was disorienting. Still, this is a lovely location and you can take pictures inside of the church at least when service is not ongoing. Once you are dropped off, you have the option of going across the street with the tour guide to Mirabell Gardens where much of “Do-Re-Mi” sequence was filmed from the ivy archway to dwarf statue to the stairs where the song finishes. But beyond the park, there are many view and filming spots to be accounted for just wandering the city, but to give you a better idea of what to look for here is a list of locations. If you love the Sound of Music and want to learn more of its history and stories around the adaptation process, this is a great tour. But one last warning, you will have this soundtrack stuck in your head for days to come, so make sure you can live with that! So, today is a little bitter sweet. This morning, I dropped my family off at the train station where they began making their way back to the states to finish the last weeks of travel without me, while I returned to the reality of my slowly falling apart flat in London (no internet connection or air conditioning, along with other continuing problems, is really not helping my mood), and I can’t believe how quickly this month has flown by! And I’ve only written about my first few days traveling! 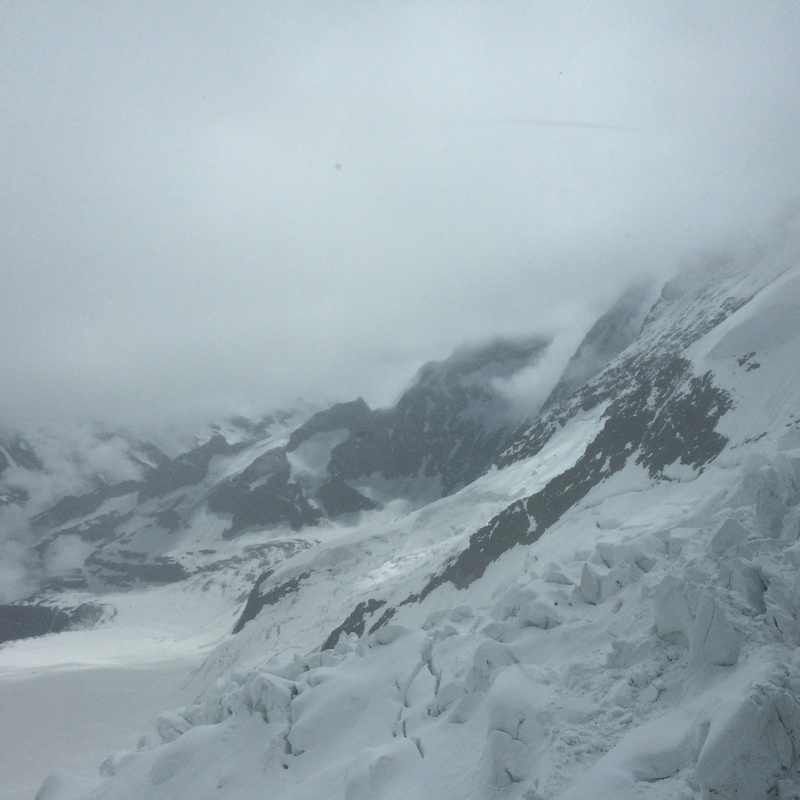 So, while I stew in a little bit of post-family homesickness before starting back to my routines tomorrow, telling you all about our big adventure in Switzerland and a little bit of our Frozen themed family love and singing on top of snowy Jungfrau seems like just the ticket. For this stop, we stayed in a great hotel in Interlaken, Switzerland with views which my sister just kept describing as simply “not real.” It’s really true. Everything on this trip looked more like paintings than actual places, which explains the continued Disney soundtrack that also seemed to follow us around. If you decide to go up this mountain, I advise checking the weather. Why do I advise this? We didn’t. The round trip ticket to get you up the mountain isn’t cheap (prices vary depending on ticket packages, ages, ect.) and time varies up and down depending on which path(s) you take (averages 50 minutes up and 40ish down, but you can choose different paths up and down the mountain if you want to see more). On each leg of the journey, you stop at about three viewing points where you are allotted time to jump out of the train and take a few pictures, as well as slowly acclimate to the elevation (3,454 meters/11,332 feet at the final rail station). Each of these stops, I’m sure, has a great vantages of the valley and surrounding Alps, but I wouldn’t really know: we pretty much just got grey fog! This isn’t to say that even in less than ideal weather a trip up isn’t worth the money or time—simply, if you have the wiggle room in your schedule, plan with the weather in mind. Like I said, if all you see out is grey, your trip isn’t a waste. Once you reach the top of the mountain, there are plenty of things to run around and do from seeing the chocolate exhibit (free samples in the shop where you may end up with multiples if you hang around long enough! ), visiting the Ice Palace, the viewing station, and taking a jaunt outside, just to name my highlights. Just like the mid-mountain viewing platforms, we couldn’t see much at the top either. Well, except that it was starting to snow. Luckily, there are pictures and paintings all over the station which show you what the views should look like on a clear day so you aren’t completely without a clue as to what you climbed up to see. My mom took a picture of each of these walls to coincide with the grey clouds we were actually seeing, just for comparison. Even in cloudy weather, sunglasses are a must—it’s bright up there and glasses also keep the elements from attacking your eyes. My two favorite parts were the Ice Palace and walking around on the actual mountain (in the outside activity area). Can you guess what this fangirl was doing during both of these parts? Yes, singing Let It Go under my breath, but I’ll have you know I passes many others doing the same thing and a few Do You Wanna Build a Snowman’s to boot. 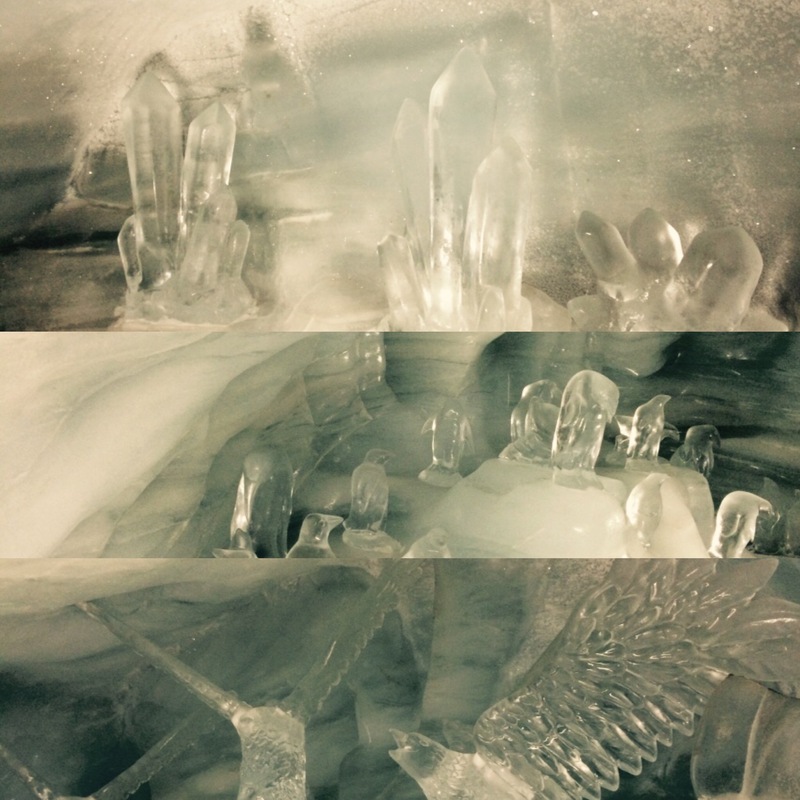 The ice palace is nothing like a castle; instead, we referred to it as the catacombs under Elsa’s Ice Palace. Almost everything here is ice from the floor to roof to walls. There are multiple passageways, ice sculptures, and alcoves to explore and it’s not hard to find yourself skating along in your shoes. This said, it’s all ice so everything is slippery with kids and adults alike moving at different speeds and levels of coordination: wear good shoes and keep your eyes peeled! This area, because of a few tighter corridors and various structural space necessities, tends to get especially crowded and (because of a few reasons like those listed above) passing people to get around can be more than a little hazardous. If you get anxious easily or crowds freak you out, this may be an issue. Still, approach with caution, but I still recommend it—even if you aren’t a Disney/Frozen fangirl about it. While everything else, except the uppermost platform, is located within the mountain top station, there is an area where you get to go out onto the actual mountain either for a quick stroll or picture, or one of the family friendly activities offered (ie sledding—however, this seems to be weather permitting, obviously). A few pieces of advice for a day like this, just to wrap up: patience is key and go early as possible (on a regular ticket). Jungfrau seems to always be crowded as they are a huge draw for individual tourist, tour groups, as well as those who want to get away from the world for a while. Getting in early and hitting the popular areas, like the Ice Palace, will let you do more with less people hanging around or jumping in front of your pictures. This means you probably won’t get clear pictures on the way up the mountain but hopefully the gloom burns off on your stops down! There are early bird tickets that help save you money, but they do restrict how much time you have up on the mountain. We spent more time on the mountain that these tickets allot you on a hazy day, so I can only imagine the time you might spend out there on a good one (especially with outdoor activities open)! So, that’s the top of the world. Not sure if I’d have done it alone, but with a few loved ones, you are sure to have some fun! ps. Any Harry Potter fans, one of the paths up or down the mountain stops at a sweet little spot called Grindelwald. We passed through for the sign but on my next path, I’ll definitely be stopping by for a wander! …and yet, somehow it is! “At last I see the light!” Mont Saint Michel, Normandy, France. June 2015. 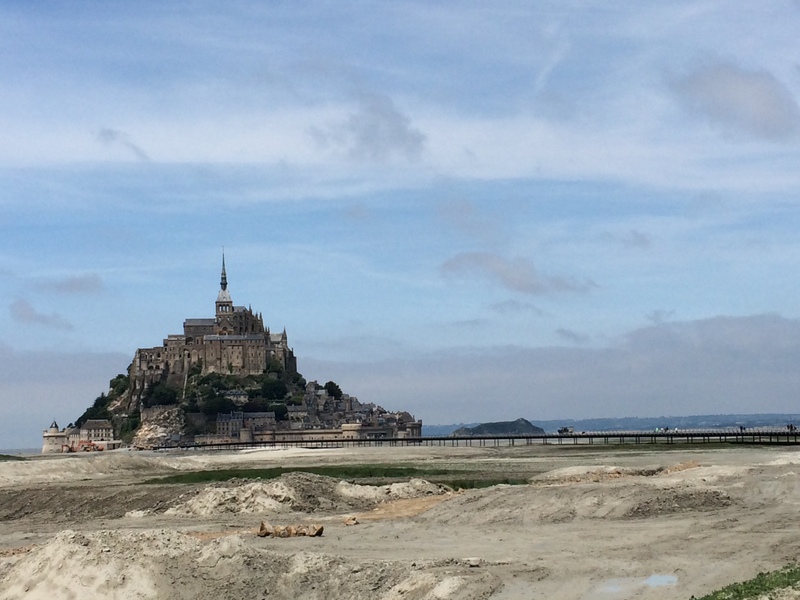 The phrase “this isn’t real” seems to have become the catchphrase to this trip and for me this really started upon first setting eyes on the fairytale setting of Mont St. Michele. This place looks so much like Disney’s Tangled’s kingdom of Corona that it almost stopped this fangirl’s heart—later my older sister explained that this was, in fact, the animators’ inspiration, so the comparison makes sense. As I wrote last week, we took the Bayeux shuttle here thinking we’d get some historical and interesting information of the day’s sights. Instead, I got to nap in and out for an hour and forty-five minutes, give or take. Nice for me, but, for the amount of money we put in, this just didn’t seem worth it. To reiterate, nice driver, but shop around for sure. But, back to the beautiful world that is Mont St. Michele. It’s easy to see how Disney animator’s would be inspired by this place. Between the winding streets, panoramic views and castle like features that make up the abbey, you’ll be singing a happy tune and thinking about braiding flowers into your hair as well. This isn’t to say that only us Disney-philes will fall in love with this floating city. The abbey is rich with local history, religious iconography and sights any enthusiast would die for. And for any hiker or exercise lovers out there, climbing around the keep will definitely help meet you calorie burn quotas! Truly a place for all types of travelers. land out there…for now. Mont St Michel, Normandy, France. June 2015. When you get past the parking lots you’ll have two choices: a cramped bus with two stops including getting to the final destination, or a thirty to forty-five minute brisk walk with tons of varied sites (we did the walk on the way back to the bus and it really was lovely!). Mont St. Michele really doesn’t seem that big of a place—you can do a quick run through in probably two hours if you really push it and if you don’t want to do anything extra. We were there for two and a half hours and were able to wander the town a little, walk the ramparts, and tour the abbey with the audio guides. So, what is it that we didn’t get to do? There was no time to sit and eat a meal, we moved from one place to another for that whole period and we did not get to wander around the mountain city (If you can call it that) and that is actually one of the activities available. When I get back here (and trust me, a full day is definitely in my future), I’ll be using both the walking options. This abbey and city/town/whatever you wish to call it, it situated on a mountain surrounded by water at high tide. Throughout a good chunk of the day, however, it sits amid various streams, puddles, and sand which you are able to walk on. The “easy” walk is around the base of the mountain which is 960 meters/3.150 feet around and you don’t need any tour guide for this. however, you have to be very aware of the tides and it’s best to still check in with information just to find out the specific rules. You will need a guide if you choose to venture further out on the sands like older pilgrims (as well as more recent one’s) have, as there are some treacherous areas and features to watch out for, including quicksand. In my next visit, I’d love to stay nearer this site (or take the train instead of a tour with a time limit) if only to see the water rise at high tide. Who knows, maybe I’ll bring a lantern and sing a little song! What can I say? I’m a Disney girl through and through. Trust me, there will be more to come! …like, a whole mess of it. Hogwarts Castle, Film Model. London, England. Summer 2013. So, I know back in March (wow that feel like forever ago!) we were talking about planning and themes. I ran a through a few but here we’re going to delve in a little deeper; a little further into the levels of geekdom and where it can take you. Once again it just has to do with research… though at other times it seems to be simple dumb luck. And of course geeking out can and often does has to do with much more than tv shows and movies—we hit cemeteries and “murder tours” because my sister is a criminology student who is a geek about her major as well as literary locations because I’m a geek for all things language and literature. But following are a few of our big geek-outs that range in widespread notoriety and we’ll talk what we saw and how to find your very own Nerd-spaces. So the picture above is one of the exhibits you can see as part of the Warner Brother’s Studio Tour London—Making of Harry Potter. This is one of the filming models and I swear I almost cried upon seeing it. I mean a serious nerdy moment of awe. If you are a fan of a specific tv/movie/book/ect, most of the big tours through official channels are worthwhile to visit. They also tend to be very easy to find. I suggest (before simple googling the title + film locations) going straight to the main studio or company who produced them and see what they have on their websites; official source means official products/ tours. However, they can cost… a lot; I mean, more than an individual’s budget may allow for. Each person has to weigh their options, but what I can say about this tour (equally, if not more than, the BBC’s Doctor Who Experience; the Doctor Who equivalent though to a smaller scale) is that you get to see tons of real props and costumes as well as screen and audio commentaries that really make the cost worth it, at least for a girl who grew up reading (read: devouring) the novels. 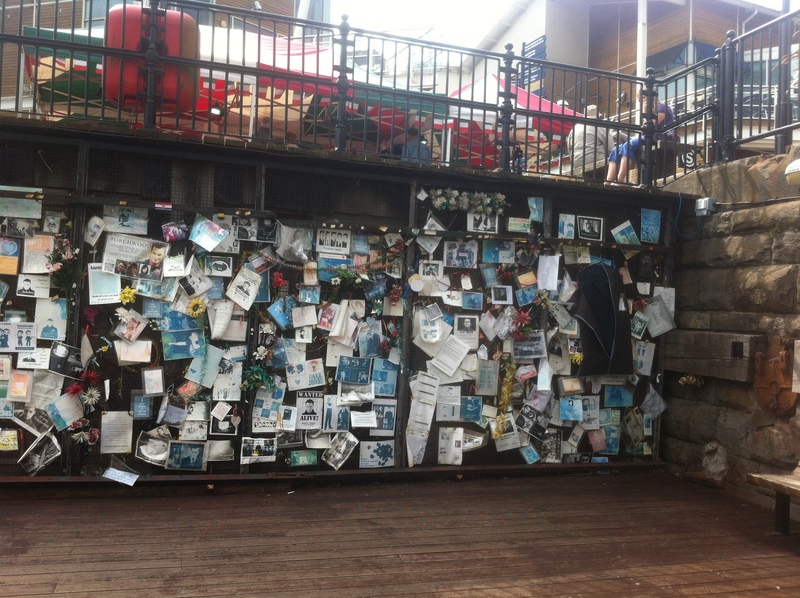 Ianto Jones’s Memorial. Cardiff, Wales. Summer 2013. Once you’ve checked out the official channels for your geeked-out travels, go ahead and work on that Google search (country/city + title + “film locations”). You’ll find tons of lists, especially if you are visiting one of the cities you are aware of your interest being filmed in. For example, if you like BBC shows, Cardiff has tons of stuff to see as well as most of wales as it has become like the US’s Canada… an area where you can live, film and produce easily and cheaply while making great tv or movies. Then work through some blogs—we talked about this approach when we were working with “walking like a local”—to see fan based locations. Thinking about it, looking through travel and your fandom on sites like Tumblr will probably give you tons of ideas as well (beware of being sucked into that black hole, of course). For our trip, these location really focused on Torchwood locations in Cardiff, Wales. You can do tours for these locations (unofficial usually) but they tend to range in both price and quality. Once you have the list of locations (go marathon the scenes before you head out, if you need to jog your memory), go off on your own; at least that’s my suggestion. It was when we were looking for Ianto Jones’s entrance to Torchwood Three headquarters when we ran straight into the wall above. Ianto Jones was/is a beloved character in the show who (spoilers!) died saving the children of Earth in 2009. This memorial was erected and was still being kept up and added to when we were visited in 2013 and is still standing strong. That’s the fun of going to these filming locations; you never know what fantastic nerdy adventures and monuments you’ll be able to experience! 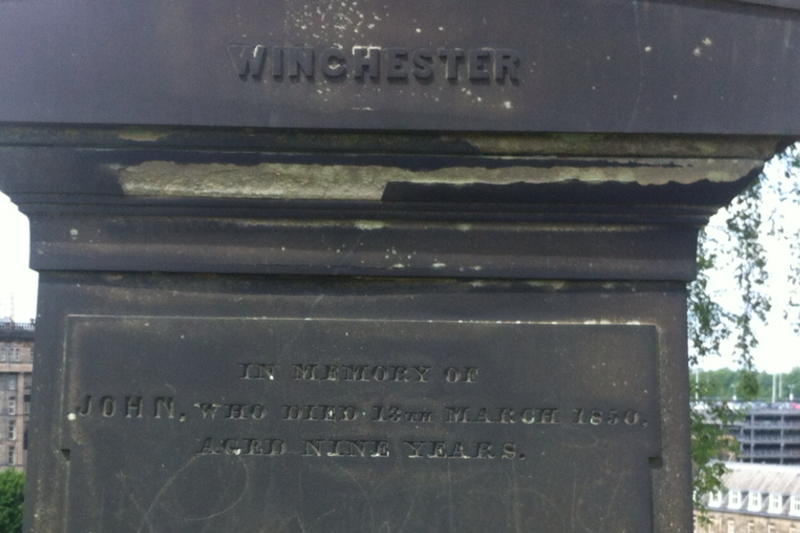 Tombstone of John Winchester—no, not the Supernatural one! Necropolis, Glasgow, Scotland. Summer 2013. Which leads us to one of my favorite fan experiences you can have while traveling (you know, besides stumbling onto a set where all of your favorite actors happen to be… You know, accidentally. ), the totally surprising and (yes) accidental ones. These are the ones you can’t or don’t research and you don’t see coming. Instead you turn around and BANG, there it is. We had this a few times on our trip. Ianto’s Wall was one, but it wasn’t as subtle and hard to come by as others. One we almost missed but had my sister running through a Scottish cemetery excitedly is featured in the image above. We were in Necropolis—Glasgow’s huge city of the dead (a little morbid but a really lovely place)—just wandering and looking out for Angels (as Who fans are wont to do and, no, we did not take pictures of those! ), when Bex did a double take. John Winchester is the father of the two protagonists on the Warner Brother’s show Supernatural and Bex is a huge fan. Yes, it was sad that the name was on a tombstone, but what were the chances of walking past and actually reading that one out of the thousands surrounding us? That’s what made it so special. Then, as we exited the cemetery, we got another fan moment. 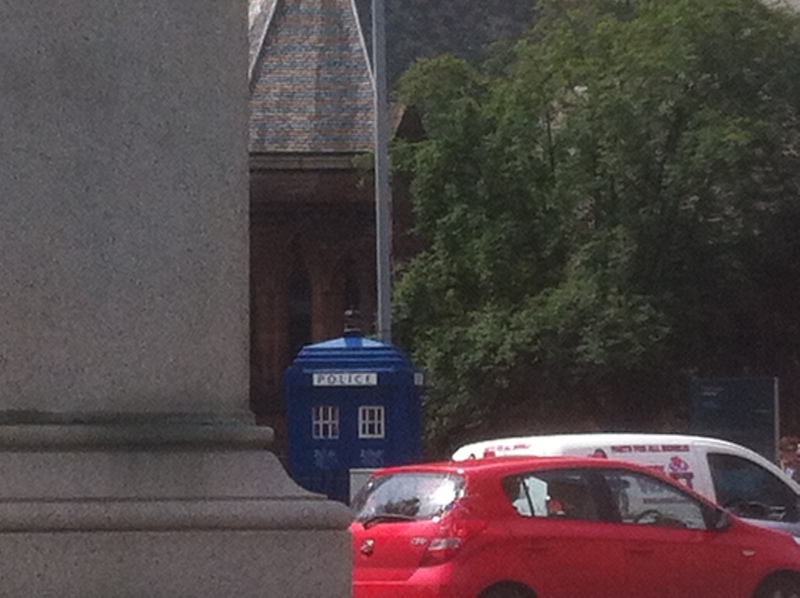 Across the street, just sitting on the corner, was an old blue box; a police box. To say we ran toward it is an understatement. For anyone who does not understand the significance, The Doctor (the namesake of the BBC’s Doctor Who) travels around time and space in an old blue Police Box called the TARDIS. To say our hearts broke a little seeing it sitting outside a graveyard is an understatement but we also were more than ready to jump on in and go on adventures with the loveable (if not incredibly broken) Timelord. Alas, the Doctor was not in but it was a huge moment of unscheduled fandom hysterics that seemed to amuse the passersby. The only advice I can give when it comes to these experience is: Just keep your eyes open! Oh, right, and of course, embrace them. We found the TARDIS! Outside Necropolis, Glasgow, Scotland. Summer 2013. So below let me know where you have found/seen/discovered some awesome nerdiness on your travels or those spots you really want to see! Also, if anyone has a specific question or topic the want to see covered in the next few weeks, feel free to drop a line about that as well.